Ray: Today was absolutely spectacular. We already got to experience what the continent has to offer. The minute we left Hercules Inlet we were struck by unrelenting winds that reminded me of being in a sand storm, but it wasn’t sand it was snow and it was very cold! We pulled the 160lb sleds uphill all-day and crossed several crevasse fields. Kevin is an expert in crossing the crevasses and while crossing one of the crevasses I happen to be the third person to cross and my sled broke through the ice and started to fall backwards into the crevasse and so I had to hang on and drag my sled out. So that was the drama for the day. A beautiful day and we are absolutely blessed to be here, and this has been an amazing day. We managed our pace today, just getting warmed up and letting our bodies adapt. We traveled about 10 and a half nautical miles today toward the South Pole. Kevin: The journey started today. There is an old saying, all journeys regardless of how big they are always start with one step and that is what I was trying to tell myself today. 1130 kilometers ahead of us is a long way to the pole and starting out into a windstorm that was snow blasting us from the start. We pulled on our hoods, strapped on our goggles, kept our heads down but none of that could soften the sting of our freezing faces, but even with that said the temperature was still ok. The crevasses were entertaining. The larger ones were bridged quite well, but since we are not carrying a rope we have to be very cautious. 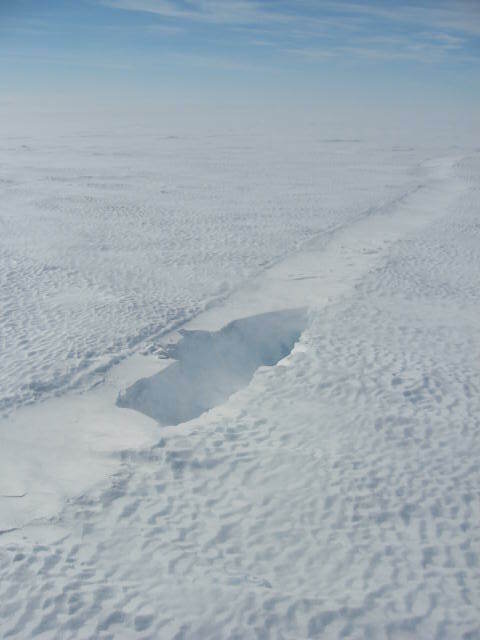 We probed with our poles and the big ones seemed to be solid but the narrow ones were only about three to four feet wide and not so solid as you would probe through, a deep hole would open to the hallows of the glacier. It was one of those weak bridges that Ray’s sled slipped into, it was a tense moment and I can remember looking over there seeing Ray being pulled backwards from the weight of the sled and desperately trying not to be dragged in. Scary. In the end Antarctica is throwing what we expected, we received a good taste of her power today, a power that demands respect. Beautiful, magical are words that continue to come to the forefront of my thoughts. We are a million miles from everyone else, and loving it out here.